Danny Wilson explains the science behind an effective warm-up and shares 5 easy steps for you to achieve a more effective pre-fight preparation to fire up your performance. Most successful Boxing performances are a result of great amounts of technical, tactical, physical and psychological preparation. This can start 12 weeks out, and finish when stepping into the ring. The final bit of that journey is the warm-up. This is a vital stage, if we get this wrong, all of our hard work could be undone through doing too little or too much. 99% of boxers will shadow box and do padwork before the fight. However, only a small percentage will perform a structured physical warm-up? Why should I perform a strength and conditioning warm-up? Maybe you’re thinking “I already feel good in my warm-ups” or “Surely we are activating the working muscles in padwork”. What about if we told you that there is a range of research that supports S&C warm-ups? And that there are simple and effective ways that can help you feel and perform even better? Would you be more open to integrating a S&C warm up into your fight prep? A warm-up can also have psychological benefits by decreasing stress, anxiety and tension. We put a S&C warm up before the pads to help the boxer get more out of his technical warm-up, raising his confidence when entering the ring. Stretching, mobilising and activating working muscle groups can improve short-term elasticity, stability and muscle contractions, resulting in more force being produced in high-velocity actions. Increased blood flow to the muscle can increase the oxygen delivered and increase muscle temperature, this helps muscles perform more forceful contractions. Raising the heart rate to the ‘red zone’ (90-100% maximal heart rate) can prime the cardiorespiratory system for performance. Increased heart rate can improve oxygen kinetics, muscle buffers and oxygen delivery, helping a boxer use energy more effectively in competition. Post-activation potentiation (PAP) is the phenomenon that acutely improves muscular force output. This is due to increased neural activity, rate of coding and recruitment of fast-twitch motor units. This phenomenon can be stimulated by a maximal/near-maximal voluntary contraction, which can be achieved with heavy lifting, jumping / plyometrics and sprints. Want some simple, easy to perform warm-up exercises to be fired up in your next fight? 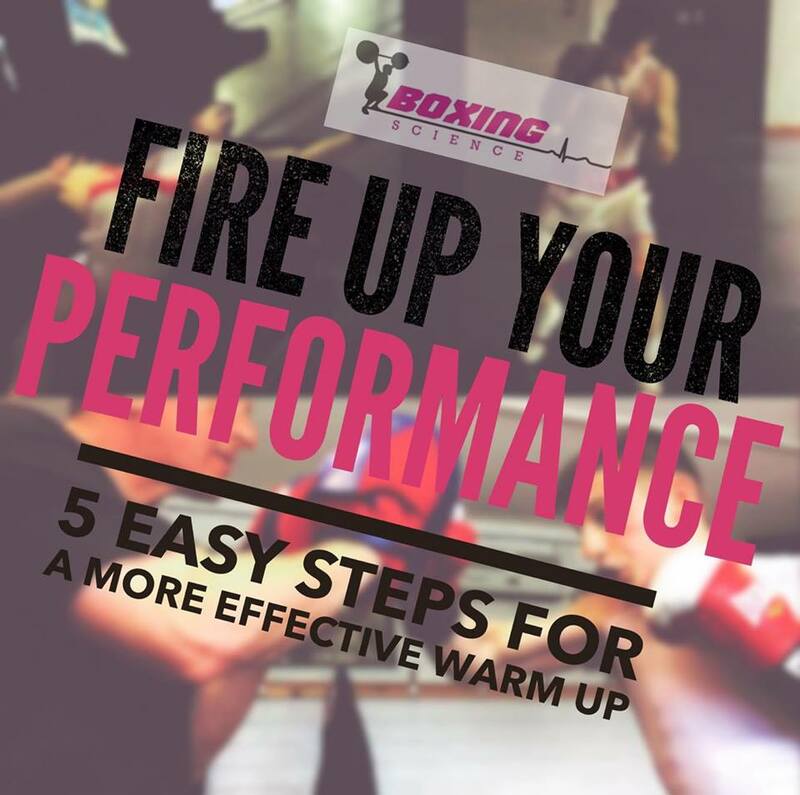 Download our FREE mini e-book ‘Fire Up Your Performance’, where you will learn 5 easy steps for a more effective warm-up.